Several different types of metal bodied fittings are available for joining small and midsize mains pipes up to around 300mm diameter. The most versatile of these are the wide tolerance fittings from UPE and Hegawa where a single fitting will fit a number of different pipe classes within any given nominal diameter of pipe. This reduces the number of fittings which needs to be held in stock and simplifies the management of projects. Where the pipe is a known diameter of a commonly used specification such as metric PVC we can also offer a selection of socket ended fittings which can be fitted without tightening any nuts. Mains size polythene pipe can be connected without welding equipment using the Hawle pushfit range of end-load resistant fittings. 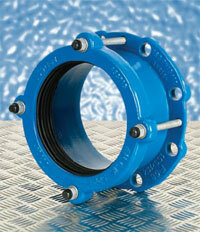 To connect larger sizes of pipe refer to our range of dedicated size fittings.